Enhancers are selectively utilized to orchestrate gene expression programs that first govern pluripotency and then proceed to highly specialized programs required for the process of cellular differentiation. Whereas gene-proximal promoters are typically active across numerous cell types, distal enhancer activation is cell-type-specific and central to cell fate determination, thereby accounting for cell identity. Recent studies have highlighted the diversity of enhancer usage, cataloguing millions of such elements in the human genome. The disruption of enhancer activity, through genetic or epigenetic alterations, can impact cell-type-specific functions, resulting in a wide range of pathologies. In cancer, these alterations can promote a `cell identity crisis, in which enhancers associated with oncogenes and multipotentiality are activated, while those promoting cell fate commitment are inactivated. Overall, these alterations favor an undifferentiated cellular phenotype. Here, we review the current knowledge regarding the role of enhancers in normal cell function, and discuss how genetic and epigenetic changes in enhancer elements potentiate oncogenesis. In addition, we discuss how understanding the mechanisms regulating enhancer activity can inform therapeutic opportunities in cancer cells and highlight key challenges that remain in understanding enhancer biology as it relates to oncology. The development of cell identity during the differentiation process in multicellular organisms creates highly specialized cells and tissues that perform unique tasks. With the premise that the vast majority of cells in a multicellular organism contain the exact same genetic information, each distinct specialized cell has enhancers that are either active or inactive. Promoters, unlike enhancers, exist immediately adjacent to a gene, show directionality and tend to have a greater degree of overlapping activity across cell types compared with enhancers ,. In humans, enhancers outnumber promoters and genes by approximately one order of magnitude , and their differential usage leads to diverse gene expression patterns, which allow for the creation of hundreds of cell functions and identities. In undifferentiated and pluripotent embryonic stem cells (ESCs), active enhancers are found in proximity to and drive the expression of genes involved in maintaining pluripotency , while genes involved in promoting lineage specification are surrounded by largely inactive enhancer elements . During cellular differentiation, enhancers that control the expression of genes involved in lineage specification become active. For example, ESCs that are induced to differentiate into neuroectoderm cells gain enhancer activity surrounding genes specifically expressed in the neuroectoderm and show reduced activity of enhancers surrounding pluripotency-related genes ,. The combinatorial binding of cell-type-specifying transcription factors (TFs) and epigenetic modifications drives this enhancer activity. The loss of cell fate commitment and gain in pluripotency are central features of carcinogenesis -. Whole-genome sequencing approaches have provided evidence that enhancers are prime targets for genetic or epigenetic alterations that favor cancer development. From a genetics standpoint, these alterations include mutations to genes that encode chromatin looping factors and TFs, which act together to bring enhancers in close physical proximity with gene promoters in order to drive gene expression. In addition, genetic alterations can affect the enhancers themselves. Epigenetic changes include abnormal deposition or removal of histone modifications or DNA methylation that serve to activate enhancers that are normally repressed, or vice versa. The characterization of changes in enhancers occurring during tumor development and progression is delineating new therapeutic opportunities in the form of targeted epigenetic treatments and biomarker discovery. In this review, we discuss enhancer biology as it pertains to the promotion of cell identity and we highlight recent findings demonstrating that genetic and epigenetic alterations influencing enhancer function are favorable to cancer development and progression. To conclude, we discuss the potential for treating cancers based on enhancer alterations and the need to address access to quality patient-derived samples and to delineate intratumor differential enhancer usage. Enhancers define cell identity by establishing cell-type-specific gene transcription programs through the recruitment of TFs active in unique cell type(s) and through physical interactions with target gene promoters . Enhancers can be discovered and defined based on a number of factors, including their epigenetic features, such as histone and DNA modifications, their transcription into non-coding RNAs, the proteins that bind them, and the three-dimensional topology that they promote. Below, we discuss each of these features and how they uniquely contribute to enhancer functionality in driving cell identities. Unlike promoters, which lie immediately upstream of the genes they regulate, enhancers can reside anywhere across the genome, including within intragenic regions ,-. Therefore, enhancer discovery presents a unique challenge. In recent years, the genome-wide mapping of epigenetic modifications that are specifically enriched at enhancers has greatly aided in their identification. For example, monomethylation and dimethylation of histone H3 on lysine 4 (H3K4me1/2) typify enhancers within a given cell type, although the H3K4me2 mark is also present at proximal promoter regions, albeit at weaker levels ,,. The additional presence of acetylated histones, such as H3 on lysine 27 (H3K27ac), is typical of active regulatory elements including enhancers. `Poised’ or inactive enhancers are similarly marked by H3K4me1/2, but are more likely to associate with histone H3 lysine 27 or lysine 9 di- or trimethylation ,,. DNA methylation at CpG dinucleotides can also mark inactive enhancers . Mapping regions of open chromatin is another way to identify enhancers, and other regulatory elements, across the genome of any cell type. This can be accomplished through DNase I hypersensitive sites sequencing (DNase-seq), formaldehyde-assisted isolation of regulatory elements sequencing (FAIRE-seq) or assay for transposase-accessible chromatin sequencing (ATAC-seq) assays ,-. A third approach to mapping enhancers relies on the observation that active enhancers are bidirectionally transcribed into RNA, generating unique non-coding enhancer RNAs (eRNAs) -. The annotation of enhancers using these techniques has greatly propelled our understanding of enhancer biology as it relates to cell identity determination. For example, Stergachis et al. used DNase-seq to show that, in addition to dramatic remodeling in which a number of gains and losses are observed, there is an overall net loss of regulatory elements when pluripotent ESCs are compared to more differentiated hematopoietic progenitors or to fully differentiated cells of the hematopoietic lineage. Similar results were also reported along the cardiac differentiation lineage . Using TF DNA recognition motifs analysis within DNase I hypersensitive sites (DHSs), Stergachis et al. also showed a reduction in the total number of regulatory elements containing motifs for lineage-specific TFs . For example, hematopoietic progenitor cells differentiating into B cells have fewer DHSs with the DNA recognition motif that is recognized by the natural killer-specific NFIL3 TF. In contrast, no reduction in this motif was reported during natural killer cell differentiation. Thus, progenitor cells maintain accessible enhancers and during differentiation undergo a reduction in the number of accessible enhancers that are unnecessary for the differentiation cell type. The genome-wide annotation of enhancers reveals their diversity. In addition to the typical enhancers, low and highly occupied targets (LOTs/HOTs) and super/stretch enhancers reminiscent of the previously reported clusters of open regulatory elements (COREs)  have been reported. Super/stretch enhancers are of interest in cell fate determination because they preferentially exist proximal to cell-type-specific genes and recruit master regulatory TFs ,. For example, murine ESC-specific super/stretch enhancers are bound by high levels of KLF4 and ESRRB, two critical factors for the pluripotency program, and surround genes that also contribute to pluripotency . Super/stretch enhancers in B cells are bound by the PU.1 TF and map close to genes expressed in B cells, including FOXO1 and INPP5D. The recent annotation of super/stretch enhancers in 86 human cell and tissue types further showcases their relevance to cell identity . Enhancer activity relies on binding TFs . The human genome is believed to encode more than a thousand TFs . These TFs bind enhancers by recognizing specific short DNA sequences (known as DNA recognition motifs) that lie in ‘open’ chromatin, which is characterized by reduced nucleosome occupancy ,. To date, fewer than 200 DNA recognition motifs have been identified , and genome-wide binding profiles (cistromes) for a few hundred TFs are available ,,. While some TFs are required across many or most cell types, others appear to be lineage-specific . For instance, PU.1 is found in the hematopoietic lineage and is necessary for B-cell differentiation . Similarly, GATA1 is required in the hematopoietic lineage to promote erythroid differentiation . In addition to TFs, enhancers can recruit additional factors to ensure their function. The specific epigenetic modifications found at enhancers are derived from the recruitment of epigenetic writers and erasers. For instance, the myeloid/lymphoid or mixed-lineage leukemia methylases MLL2, MLL3 and MLL4 (also known as KMT2D, KMT2C and KMT2B, respectively) are histone methyltransferases that bind regulatory elements and are responsible for deposition of the enhancer marks H3K4me1 and H3K4me2 -. Similarly, lysine acetyl transferases such as CBP (also known as CREBBP) and P300 (also known as EP300) bind enhancers to increase their activity through protein acetylation, inclusive of histones ,. The EZH2 methyltransferase creates silenced or poised enhancers through the H3K27me3 modification ,. DNA methylation also marks some silent enhancers in normal cells ,, with the DNA cytosine-5-methyltransferases DNMT1, DNMT3A and DNMT3B establishing this mark, and the TET methylcytosine dioxygenases TET1, TET2, TET3 necessary for active removal of DNA methylation ,. The presence of specific epigenetic modifications at enhancers allows the recruitment of epigenetic readers. For example, BRD4 recognizes histone acetylation, including H3K27ac, leading it to occupy chromatin preferentially at cell-specific super/stretch enhancers ,,. Long non-coding RNAs (lncRNAs), which are RNAs of more than 200 nucleotides in length that lack protein-coding potential , can also serve as enhancer-like elements to regulate gene expression . For instance, non-coding RNA-activating (ncRNA-a) regulates the expression of adjacent protein-coding genes independently of their orientation, similar to typical enhancer elements . Other lncRNAs influence enhancer activity through their interaction with epigenetic factors. For example, the lncRNA HOTAIR interacts with the polycomb repressive complex 2 (PRC2) to facilitate the deposition of the H3K27me3 repressive epigenetic modification on the chromatin at the HOXD locus, whereas the lncRNA HOTTIP activates transcription of 5 HOXA genes through recruitment of WDR5/MLL complexes . Accordingly, lncRNAs can play a crucial role in maintaining cell identity. For example, the lncRNA Tcl1-upstream neural differentiation-associated RNA (TUNAR) interacts with a complex of proteins to promote expression of the pluripotency factors Sox2, Nanog and Fgf4 in mouse ESCs . In addition, RNA-interference-mediated knockdown of seven abundantly expressed lncRNAs in mouse erythroid cells inhibited terminal erythroid differentiation , raising the possibility that a large number of tissue-specific lncRNAs are necessary for cell identity programs. Enhancers rarely regulate the expression of the most proximal gene . In fact, they may be separated from their target promoter(s) over genomic distances that can exceed millions of base pairs (megabases) ,. Although enhancers can help recruit RNA polymerase II, which then tracks along the DNA to find its target promoter , enhancers are typically reported to act by physically interacting with their target gene promoters through long-range chromatin interactions, or loops ,. These interactions form during cell differentiation , and are involved in establishing the chromatin architecture permissive to stimulus-specific transcriptional responses . As enhancer usage is largely cell-type-specific, it is not surprising that these interactions are also unique to different cell types and undergo large-scale changes during differentiation . Ubiquitously expressed proteins, including the CCCTC-binding factor (CTCF), as well as the cohesin and mediator complexes, are known to mediate chromatin interactions ,-. Chromatin immunoprecipitation coupled with next generation sequencing (ChIP-seq) assays against subunits of the cohesin complex, including SMC1A and SMC3, reveal that they localize to enhancers, promoters, regions bound by the mediator complex and cell-type-specific TFs ,. The cohesin complex was also shown to mediate chromatin interactions, inclusive of those connecting promoters to enhancers ,. CTCF has historically been associated with an insulator function in the genome, by which it blocks interactions between enhancers and promoters ,. However, genome-wide profiling of CTCF binding and subunits of the cohesin complex exposed a substantial degree of overlap between these factors ,. In addition, CTCF was observed to localize at tissue-specific enhancer elements ,, suggesting a role for CTCF in mediating physical interactions between DNA regulatory elements and in driving the chromosomal conformation that is necessary for cell type specification. A role for eRNAs in promotion of long-range promoter-enhancer interactions to regulate gene expression has also been recently reported. Li et al. have described eRNAs induced by estrogen in breast cancer cells that mediate promoter-enhancer interactions that are also dependent on the cohesin complex . Furthermore, Hsieh et al. also discovered an eRNA proximal to KLK3 in the KLK locus that enables enhancer interactions with KLK2. Others, however, have shown that inhibition of eRNA generation during the estrogen response in MCF7 breast cancer cells does not affect TF binding, epigenetic modifications or chromatin loop formation to target genes , suggesting that these events precede eRNA transcription. Enhancers provide a basis for cell identity. Thus, the maintenance of cell-type-specific enhancer activation is critical in order to avoid improper, or the lack of a necessary, enhancer function and the development of life-threatening malignancies. Indeed, recent whole-genome sequencing studies have established that alterations to enhancers can occur through aberrant epigenetic modifications, sequence variation, or mutations, within enhancer binding factors and within enhancers themselves. In this section we discuss the epigenetic and genetic changes that alter enhancer function and contribute to an altered cell identity. Fluctuations in DNA methylation levels are typical of cancer development and can directly impact enhancer activity (Figure 1a, Table 1). Yegnasubramanian et al. described DNA methylation gains at conserved intergenic regions across chromosomes 21 and 22 in prostate cancer cells , indicating the potential for a previously unappreciated role of DNA hypermethylation in enhancer regions. Subsequently, Aran et al. further established DNA methylation changes in enhancer regions linked to cancer genes in diverse cell types including breast, lung and cervical cancer cell lines . In addition, Taberlay et al. have recently described widespread changes in DNA methylation of nucleosome-depleted regions within distal regulatory elements in breast and prostate cancer cells . Intriguingly, they found that the majority of epigenetic changes at enhancers from both benign and cancerous cells were gains in epigenetic silencing as opposed to aberrant activation, suggesting that it is a net loss of features that drives specific cell identity. Enhancer biology in normal and malignant cells. The center of the figure shows how, in normal tissue, cell-type-specific transcription factors (TFs) bind to enhancer elements to drive expression of target cell identity genes, while enhancers utilized in alternative cell lineages are poised or silenced. (a) Enhancer (E1) repression in the course of cancer development through either acquisition of DNA methylation or chromatin compaction blocking TF binding. (b) Genetic alterations in an enhancer (E1), altering its normal function through either blocking TF binding or inducing the binding of a new TF. (c) Enhancer (E2) activation in the course of cancer development through epigenetic changes, resulting in chromatin openness favorable to TF binding and target gene expression. (d) Genetic alterations resulting in the activation of an enhancer (E2) normally inactive in normal cells. eRNA, enhancer RNA; LF, chromatin looping factors; P, promoter; PolII, RNA polymerase II. Abnormal patterns of histone modifications at enhancers also characterize the development and progression of several malignancies (Figure 1a,b, Table 1). Through H3K4me1 ChIP-seq assays, Akhtar-Zaidi et al. identified differential enhancer usage between normal and primary colorectal tumor cells, terming these `variant enhancer loci (VELs). VELs were found to correlate with the transcription of putative target genes and predicted gene expression patterns in a manner that was concordant with a gain or loss of enhancer state . In addition, there was a markedly greater repression of genes associated with enhancer loss than there was activation of genes associated with enhancer gain. Gains in enhancer activity were also reported at loci associated with ESCs during cancer development and progression . Using DNase-seq data to define active regulatory elements based on chromatin openness, followed by principle component analysis, Stergachis et al. determined that tumorigenic cells commonly displayed a regulatory landscape more similar to that of ESCs as opposed to differentiated cells of varying origin (that is, endoderm, ectoderm, mesoderm) . In addition, gains of open chromatin were observed in other cell lineages and in sites not observed in any normal cells, suggesting that cancer cells invoke the activity of atypical enhancers to activate oncogenic pathways . With respect to tumor progression, Magnani et al. described distinct epigenetic landscapes associated with enhancers in breast cancer cells resistant to endocrine therapy compared with those responsive to treatment . This revealed that endocrine-therapy-resistant cells rely on the NOTCH signaling pathway to elicit alternative enhancer usage and cell survival independent of estrogen signaling . Active NOTCH signaling is required for normal mammary stem cell function , implying that the development of endocrine therapy resistance in breast cancer cells may rely on the reversion or reactivation of stemness pathways and a loss of estrogen responsiveness that is typical of luminal breast cancer cell identity. VELs are not restricted to single enhancers but can also give rise to super/stretch enhancers. This has been documented in diverse cancer types, including multiple myeloma, B-cell lymphoma, colon, prostate, breast and cervical cancers ,,. Specific genes, such as the MYC oncogene, are associated with variant enhancer loci that cluster with other VELs to form super/stretch VELs in many cancer types . These are reminiscent of super/stretch enhancers. Other genes preferentially associate with super-VELs only in specific cancer types, such as XBP1 in multiple myeloma, in which it is known to be critical for disease development ,. Enhancers are also hotspots of genetic alterations promoting cancer development. The majority of disease-associated single nucleotide polymorphisms (SNPs) and their associated loci commonly lie within non-coding regions of the genome and thus do not directly alter the amino acid sequence of a protein . These disease-associated SNPs typically map to enhancers - and directly alter the binding affinity of TFs for their respective DNA recognition motifs (Figure 1c,d) ,,-. For example, breast-cancer-associated SNPs map to enhancers bound by the forkhead box A1 (FOXA1) TF and ERα, and modulate the affinity of FOXA1 for DNA, resulting in altered target gene expression . Similar mechanisms are at play in prostate cancer ,,, colon cancer  and acute myeloid leukemia (AML) . Enhancers targeted by risk variants associated with colorectal cancer are significantly enriched within VELs for this disease . Similarly, SNPs associated with breast cancer are significantly enriched within differentially methylated enhancer elements in breast cancer . This suggests a convergence on these enhancers, by which their activity can be altered, either through genetic or epigenetic alterations. Whole-genome sequencing of tumor samples has identified thousands of somatic mutations outside of coding regions -. While only a subset of these mutations is likely driving cancer development, the fact that enhancers can be affected by mutations that predispose to cancer supports the idea that somatic mutations may alter enhancer function (Figure 1c,d, Table 2). Several lines of evidence support this hypothesis. For example, translocations commonly found in Burkitt’s lymphoma place the MYC oncogene in control of intronic and 3 IGH enhancers, ultimately leading to deregulated expression of MYC and the development of lymphoma ,. Deletions of the locus control region that contains enhancers controlling β-globin gene expression have also been described in sickle-cell anemia patients . Point mutations within the telomerase reverse transcriptase (TERT) promoter enhance TERT expression in melanoma, and in cancers of the central nervous system, bladder and thyroid -. These mutations provide de novo DNA binding motifs for ETS family TFs . Finally, point mutations in enhancers surrounding SHH and SOX9 lead to polydactyly and a form of severe skeletal malformation (campomelic dysplasia), respectively ,, while point mutations in enhancers proximal to TBX5 and PTF1A lead to congenital heart defects and pancreatic agenesis, respectively ,. Tumor sequencing efforts have identified mutations in genes encoding lineage-specific TFs that preferentially bind enhancers, such as FOXA1 and members of the GATA binding protein family (Table 2) ,-,,. FOXA1 mutations have been discovered in breast and prostate cancers . These mutations occur within the DNA binding and C-terminal domains of the protein and a subset was shown to be favorable to tumor growth . GATA2 is a TF that is critical for the formation of primitive erythroid cells and is expressed in hematopoetic stem and progenitor cells ,, while GATA3 plays an important role in luminal differentiation of breast epithelial cells . Mutations in GATA2 are prevalent in familial AML/myelodysplastic syndromes , whereas mutations of GATA3 occur in ~10% of breast cancers -. RUNX1 (a TF required for differentiation of blood cells) is another example of a lineage-specific TF that is preferentially mutated in AML (~9% of cases) compared with other cancer types (mutated in less than 4% of cases for other cancer types) . Mutations in epigenetic factors that bind enhancers have also been reported in cancer. For example, the enzymes responsible for the H3K4me1/me2 epigenetic modifications, specifically the MLL2, MLL3 and MLL4 genes, are significantly mutated in three or more cancer types ,,. EZH2 is also commonly mutated in diffuse large B-cell lymphomas and follicular lymphomas . Although DNA methylation is not uniquely found at enhancers, mutations in the DNMT3A and TET2 genes were reported in AML ,. DNMT3A is a methyltransferase involved in the de novo methylation of CpG dinucleotides  and TET2 converts methylcytosine to 5-hydroxymethylcytosine . Finally, factors involved in long-range chromatin interactions, including CTCF, the cohesin subunit stromal antigen 2 (STAG2) ,, SMC1A, SMC3, RAD21 and the loading protein Nipped-B-like (NIPBL) are significantly mutated in cancer ,. Furthermore, the mediator complex subunit MED12, which is known to contribute to chromatin loop formation , is mutated in cancers of the prostate and adrenal cortex ,. The exact role of these mutations remains to be clarified, but the idea that they could provide an oncogenic benefit by affecting chromatin interactions, and thus modifying enhancer-promoter interactions, warrants further investigation. Taken together, these results suggest that mutations in lineage-specific TFs, epigenetic enzymes and chromatin-interaction factors can promote cancer development. Whether these genetic changes impinge upon TF binding, epigenetic profiles or overall chromatin conformation, and whether this has an effect on cell identity is not known and should be the focus of future research investigating specific mutations. Deregulated expression of lncRNAs that can impinge on enhancer activity may also contribute to tumorigenesis. For example, HOTAIR overexpression in breast cancer leads to genome-wide alterations in H3K27me3 and promotes invasive and metastatic cell properties . HOTTIP is also overexpressed in hepatocellular carcinoma, leading to increased HOXA13 expression and cell proliferation . Furthermore, colon-cancer-associated transcript 1-long isoform (CCAT1-L) lncRNA is found in a super-enhancer upstream of the MYC oncogene, where it promotes looping and expression of MYC . Yang et al. have also studied two prostate-cancer-associated lncRNAs, PRNCR1 and PCGEM1, characterizing them as interacting with the androgen receptor (AR) TF, facilitating the looping of AR-bound enhancers . These lncRNAs also promoted ligand-independent activation of the AR transcriptional program, thereby potentially contributing to castration-resistant prostate cancer development. However, Prensner et al., using RNA immunoprecipitation studies, failed to detect the interaction between these lncRNAs and AR, questioning the validity of the initial findings . While it remains plausible that lncRNAs act as co-factors in TF-enhancer interactions that promote cancer progression, additional work is needed to address these discordant results. Alterations in enhancer usage and activity are a driving force behind oncogenesis and thus have broad medical applications. First, both genetic and epigenetic changes in enhancers may be useful as biomarkers for both diagnosis and prognosis of cancer. SNP profiles, for example, can distinguish the relative likelihood of developing particular neoplasms. DNA methylation of enhancers may provide useful prognostic information beyond classical pathological parameters. The vast majority of work to date in the field of DNA methylation, however, has been heavily promoter biased. An enhancer focus may yield more clinical information. Epigenetic modifications to enhancers are also therapeutically targetable, given the recent development of numerous inhibitors to epigenetic readers, writers and erasers. For example, bromodomain inhibitors are being widely investigated for their potential as anti-neoplastic agents. These compounds act by binding the bromodomain of the BET family of proteins, blocking their binding to acetyl-lysine residues and inhibiting activation of gene transcription. Interestingly, the unique features of super/stretch enhancers may make them more responsive than typical enhancers to such inhibitors. For instance, the treatment of myeloma cells with JQ1, a BET bromodomain inhibitor, decreases their proliferation with concomitant reductions in super-VEL-associated oncogene expression . Enhancers are components of the genome that function to regulate gene expression and are critical for proper cellular differentiation. The identity of any given cell type is tied to the cell-type-specifying TFs that it expresses and, in turn, to the enhancers that these TFs bind. Abnormal enhancer activation or repression and TF activity drive cancer development and progression through the activation of oncogenes and expression programs from alternative cell lineages, in conjunction with the silencing of tumor suppressor genes and programs necessary for terminal differentiation. These enhancer alterations have the potential to be used both as markers of disease and as avenues for therapeutic intervention. Whole-genome profiling strategies, particularly when based on massively parallel sequencing, have greatly increased the rate at which new discoveries are made regarding enhancer biology in both a normal- and tumor-cell setting. Projects such as the Encyclopedia of DNA Elements (ENCODE) have greatly expanded our knowledge of the functional genome beyond coding sequences . Current efforts, such as those led by the Roadmap Epigenomics Program and the International Human Epigenome Consortium (IHEC) are geared towards characterizing the functional genome in human tissues ,. Studies using cancer tissues as opposed to cell lines will also be necessary. Using tissue samples, however, will present a series of challenges, including cellular heterogeneity in bulk specimens . Sorting cells using cell-type-specific markers followed by regulatory element profiling may overcome these challenges. As an example of this issue, breast epithelium consists of distinct epithelial cell types, and it is postulated that unique cell types give rise to the different breast cancer subtypes -. If true, it is likely that many enhancer alterations described in cancer are representative of a specific cell of origin present in only a fraction of normal breast cells. The heterogeneous mixture of cancer cells in tumors with differing capacities to proliferate, migrate and regenerate also poses a challenge when using tissue samples . Identifying subpopulations of cancer cells with differential enhancer usage compared with the bulk may help to better characterize the biology behind aggressive and metastatic phenotypes. Despite the challenges that lie ahead, we have gained a greater understanding of the role that enhancers play in tumor development and progression. Causal mutations in enhancers , and the gain of super/stretch enhancers driving oncogene expression ,, strongly support a role for enhancers in tumor development. The discovery and proven efficacy of new therapeutic agents that target epigenetic factors found at enhancers, such as JQ1, further substantiates the importance of enhancers in cancer. Future research focusing on the assignment of enhancers to their target genes may also have clinical implications when considering disease prognoses and targeted therapies. 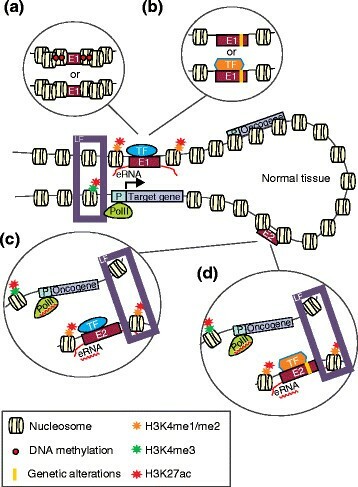 Genome-wide profiling of mutations that map to enhancers or of the activation or inactivation of enhancers in tumors is anticipated to reveal particular disease outcomes and point to therapies that can be tailored to the specific transcriptional network associated with these genetically and/or epigenetically altered enhancers in cancer. Enhancers play a central role in cellular identity and increasing evidence demonstrates that they are primary targets of alterations promoting cancer development and progression. Overall, this strongly supports a transition in cancer research from the gene-centric view to a comprehensive approach inclusive of these non-coding regulatory elements. The National Cancer Institute (NCI) of the National Institutes of Health (NIH) under award number R01CA155004 (ML) and the Princess Margaret Cancer Foundation (ML) supported the research reported in this publication. The research content reported is the sole responsibility of the authors and does not necessarily represent the official views of the funding sources. ML holds a young investigator award from the Ontario Institute for Cancer Research, a New Investigator Salary Award from the Canadian Institute of Health Research (CIHR) and a Rising Star in Prostate Cancer Research Award (Prostate Cancer Canada/Movember). KJK is supported by a Canadian Breast Cancer Postdoctoral Fellowship. SDB is supported by a Canadian Institute of Health Research Postdoctoral Fellowship.